The cleaning industry has become home to many individual professionals and big companies. Everyone is trying to get their piece of the cake. The thing is that the number of cleaning businesses is growing faster than the number of their customers. Thus, one client might happen to meet three or four different cleaning contractors before the actual partnership is sealed. The process remains the same: a customer gets a quote from a cleaning agency, he/she reviews it and agrees to the terms and conditions with the company, and then the operatives do the job that is stated in the contract. Just like in the tourism industry, where there are a lot of the same players in the market, the service has to be outstanding and offered for the right price so that the customer gets satisfied. But how not to become a victim of the newcomers who simply want to make some money and do not care about their customers and their company’s reputation? Easy profits and relaxed regulations make any business attractive for new players. Nowadays, cleaning services are being offered by so many companies and agencies that it is easy to get lost among their names and colourful adverts. But remember that you are not ordering pizza for you Friday evening meal, so be careful when you book your cleaning services from any company or agency. Behind a thousand of glorious feedbacks and years of operation you can discover an amateur firm acting as the cleaning agency that fails to deliver the services you ordered because they recruited pizza drivers instead of cleaning operatives. In order to avoid frustration in booking cleaning services or finding the right cleaning company, be ready to act professionally. Professional cleaners never drop tiny leaflets in your pigeon hole. If you get one, put it into the bin. You would have probably gotten this leaflet from some amateur cleaners trying to spread the message using old marketing tools. Cleaning professionals normally pay personal visits to establish the contact with their customers or advertise themselves through the solid channels, including social media. Amateur cleaning companies do not provide uniform for their members of staff. They think it is a good way of saving business costs, but they actually lose on branding and reputation. It is not only the uniform that portrays the company or the business itself. Make sure people who are going to deliver your cleaning services look respectfully and act professionally. Otherwise, show them where the exit is and do not bother about showing extra respect. Cleaning professionals do not talk much about themselves. It is their clients who remain satisfied with their work and speak for them. Finally, true professionals get trending and attract positive talks about their performance. Of course, low quality cleaners can break the news too, but this would be a different headline. Master cleaners always use professional materials and tested equipment. Before they start doing their job they will tell you everything about their services and inventory. Challengers will only be focusing on cheap price and short terms instead. Do not get fascinated by the information you are likely to get from your gas company. You can easily determine an amateur by asking them a tiny question that would concern some deeper aspects of the service they are desperately trying to deliver but are not good enough to do so. If you do not know how to determine an unprofessional cleaning operative from a true master of their kind, feel free to get a consultation from the agency before ordering any services. This is guest post and proudly provide by Hackney Carpet Cleaners. When it comes down to professional cleaning services, it is really important to mention, that the really high-level London cleaning companies use certified technicians, who have undergone training and a decent period of on field practice. 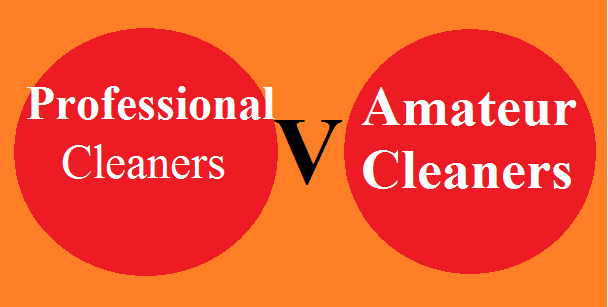 Amateur cleaners do not undergo certification and barely invest into high-end gear as well.